Hi guys! Long time no post, am I right? Not blogging makes me sad, but with my fun-filled spring break, I really just needed to try to focus on spending quality time with my family that was visiting me from Texas and now adjusting back into my school/work schedule this week has been super (not) fun. I'm glad that I did take that little break though and I now have a few posts from our adventures together to share. But first, let's talk about this Japan thing: IT IS SUPER CLOSE! Like 13 days away close! 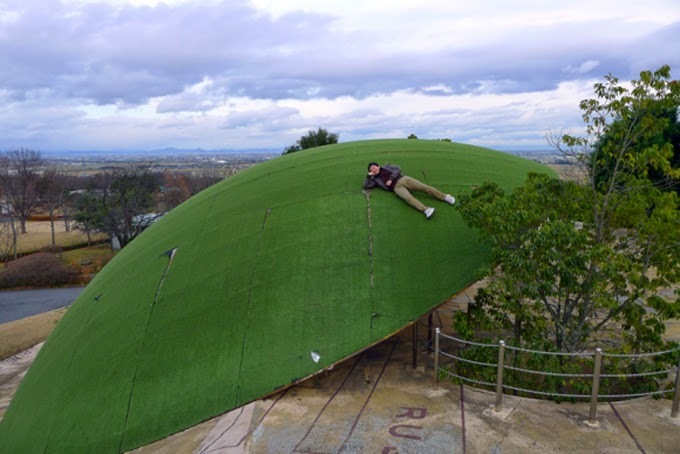 I thought that it would be cool to share a few things that are on my list for us to do and see in Japan. I loved creating a post like this for when we went to New York and decided to do it again for this trip! 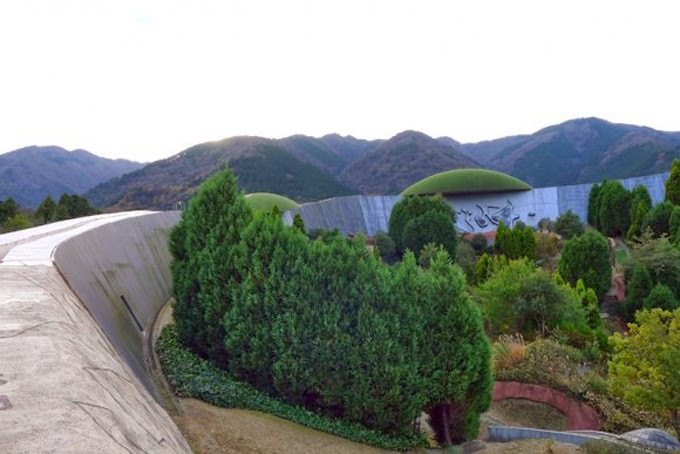 I really didn't know much about Japan before researching for our trip, but I have found quite a few cool things to do! Hopefully we will get to do most of them, as I'm not entirely certain about the geography of everything and what is actually doable versus not. 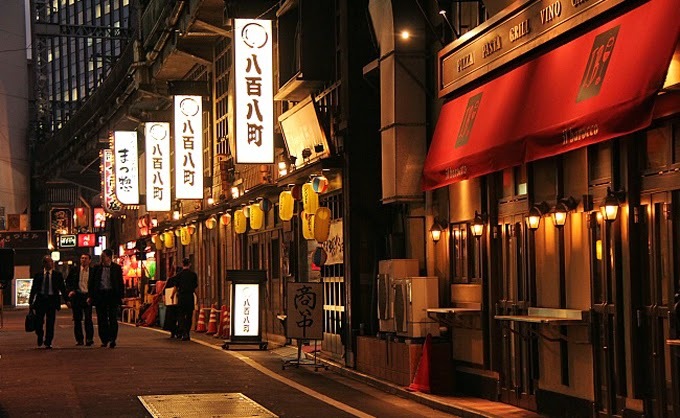 This specific part of town under the railroad tracks is known for its street food and izakayas (places to drink and eat with friends, so basically bars with better food haha). From the photos I have seen, it just seems like a fun and lively place to be, and Dai has assured me that we will be coming here. We are definitely doing this! In fact, we are spending a few days at an onsen (hot spring, but then also a term that can be used to describe an inn type place surrounding it [according to Google? ]), so this will be really fun! Not exactly sure what the hot springs will look like, but I thought that this image was good enough for now until I get my own photos :) Can't wait to relax in some hot water! I've been told that this has been crossed off the list for this trip, but I still wanted to include it in this post since it is beautiful. 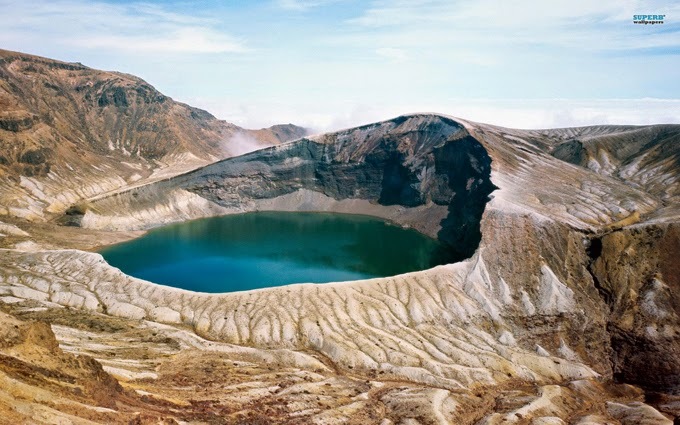 Apparently this crater lake is a little hike away, but also changes colors and is a lovely sight to be seen. Next time maybe! Completed in 2012, (I believe) this building is the tallest in the world. Just look at it. It is ridiculous. For comparison, the Empire State Building is roughly half the size. 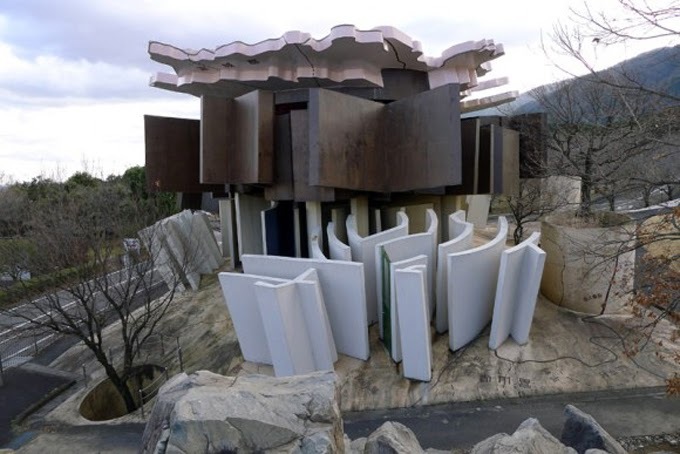 I don't know if we will actually take the tour inside the building (depends if we feel like spending the money), but I am sure it is a sight to be seen from the ground as well. Here's another slightly random place on our list. 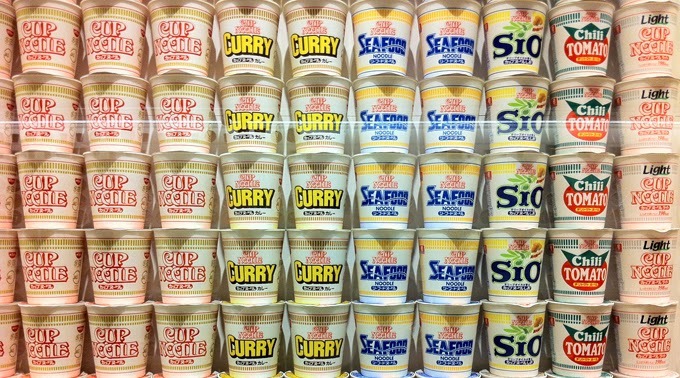 Do you like those Cup Noodle instant ramen cups? This is how they make them! I think that this tour, while kind of off-beat, would be really interesting and fun! 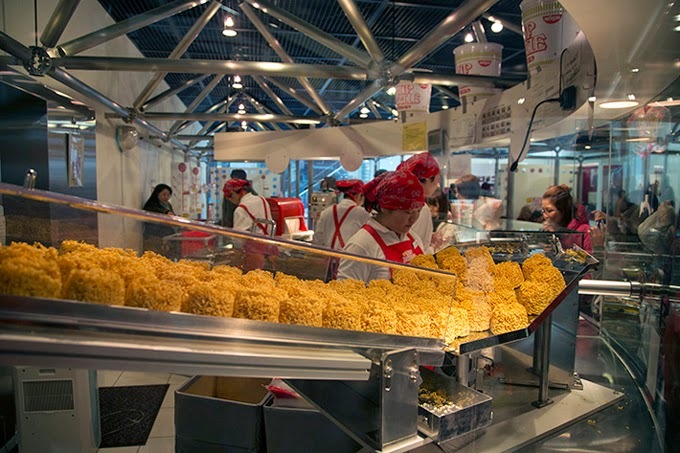 They even have an area where you can create your own custom Cup Noodle package to take home. I came across this on The Nectar Collective when looking back at places that Melyssa visited when she lived in Japan. I always think it is fun to take in a museum (besides an instant ramen one) on trips, and since the SF MoMA is currently closed for 3 years, I thought this one might be fun! Clearly attractions with animals are a priority to us (Dai is now talking about visiting a monkey mountain? I don't even know). At Nara Park, there happens to be a large deer population that you can visit with and feed. 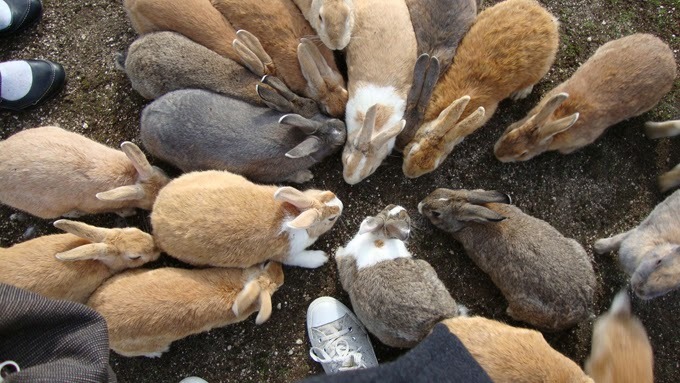 Dai has been in the past and tells me that as soon as you start to open food, they all come running. I mean, who doesn't want to hang out with some deer? I am not really even sure how to describe this place. As I have read, it is a park that was designed by artists and is basically filled with installation pieces that serve as parts of the park. You can climb and explore all parts of it at your own risk. The randomness of the whole place make it rather dangerous and I have heard that you are offered a helmet upon entering (good sign!). I just had to include a couple more photos of this place below since it is so interesting! There's definitely much more on our list, but I hope you enjoyed this little look into our agenda! I am getting so excited about this trip and putting this post together made it all feel so much more real. Ahh! Which of these places would you want to visit? Anything you know of that we should definitely look into? P.S. Something not mentioned here is the possibility of going to a cat cafe. Yes, you read that correctly. I don't even like cats, but I am liking the idea of drinking a cup of coffee while petting some cats. I don't know what is wrong with us, but I don't want us to ever change. Japan sounds so exciting! I went to Korea last year and there were many similar things, like a cat cafe! I would definitely go to the cat cafe; it was a little pricey (equivalent of $8 for a coffee), but there were cats everywhere! They were very nice and friendly and it was a really good time. Have a great time on your trip! waaaaaah I am so freaking excited for you. I am just about ready to explode. I CANNOT WAIT for all the posts that will come in the next few months. EEEEK. 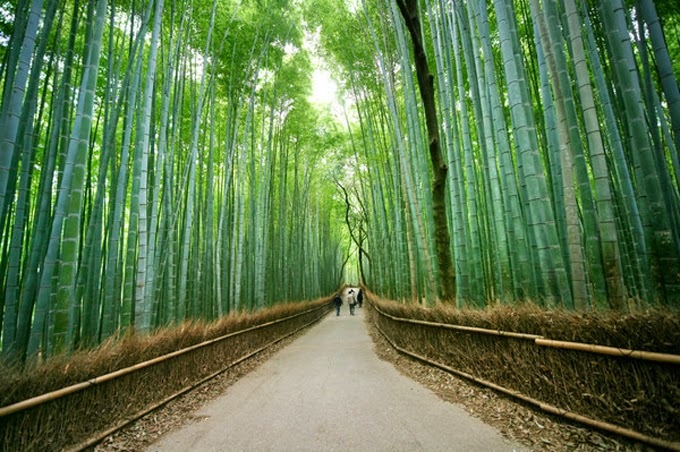 The bamboo forest looks INCREDIBLE! 2 questions....1.) how the crap am I just now finding your blog? haha. it's so cute and I love it...glad to be following along! and 2.) when are you going to japan? (or did you say and I missed it due to being struck by the beautiful photos?) haha. THAT will be a fun trip for sure! I know!! Really looking forward to this!! Korea sounds so cool too! I actually just had Korean food for the first time last night and it was delicious haha. I'm glad you had a nice experience at the cat cafe! I think it will definitely be a fun thing to do. Thank you so much! You're so sweet! I'm glad you found me (and I you)! I am actually leaving for Japan 1 WEEK FROM TODAY! WOOHOO! So, so excited. Feels surreal!